A few weeks ago I went to a healing conference and experienced some new therapies. One of these is salt therapy, excellent for those with allergies, asthma and other ailments such as stress. I went for a session at Breathe Easy and was most impressed—I took my boys there as well as they suffer from seasonal allergies and we all benefited. 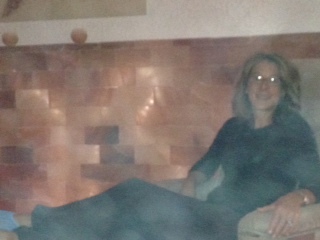 This is me in the salt room–the haze you see is the salt particles; below is one of my boys being buried in the salt by the other. Dry salt therapy, or halotherapy, originated in the salt caves of Eastern Europe which were found to have healing properties and kept salt miners free of respiratory and skin ailments that were common to other miners. It has since been adapted to become a standard healing and prevention practice throughout Europe and is even available in many hospitals and doctors’ offices. The salt rooms and beds at Breathe Easy recreate the therapeutic salt cave environment with pink Himalayan salt coating the floor and walls and white pharmaceutical grade salt ground up and dispersed into the air to be inhaled naturally. The salt particles enter the airways and break down mucus, kill bacteria, relieve inflammation, increase oxygen flow throughout the body and give the immune system a boost by keeping the lungs, sinuses and air passages free of bacteria, mucus, allergens and toxins that get embedded in these areas, irritate sensitive tissues and spread infections. It also balances the pH level of skin and exfoliates, buffing away dead skin and stimulating healthy skin cell replication. While certainly not intended as a cure or remedy for cancer, salt therapy can be relaxing and healing—and may reduce your need for toxic allergy medications. Please note that salt therapy is not advised during chemotherapy as the detoxification process of Dry Salt Therapy may react with the Chemo. However, once treatment is finished, salt therapy, along with drinking plenty of pure water, exercising and eating a proper diet rich in fiber and phytonutrients, may help to detoxify after such treatments and support the healing process. MEDICAL DISCLAIMER: Reading the information in this post does not constitute a physician-patient relationship, and I encourage you to discuss this information with your integrative oncologist or naturopathic doctor. The information included in this post is for educational purposes only. It is not intended nor implied to be a substitute for professional medical advice. Always consult with your healthcare provider regarding a medical condition or any treatments. I love the salt therapy and it has really helped with my sinuses and cough. I am concerned as I still get a dose of Retuxan every 3 months and gamagard once a month. Should I not be doing the salt? ?